BACSSP Strategic Planning June 28 and 29, 2009. 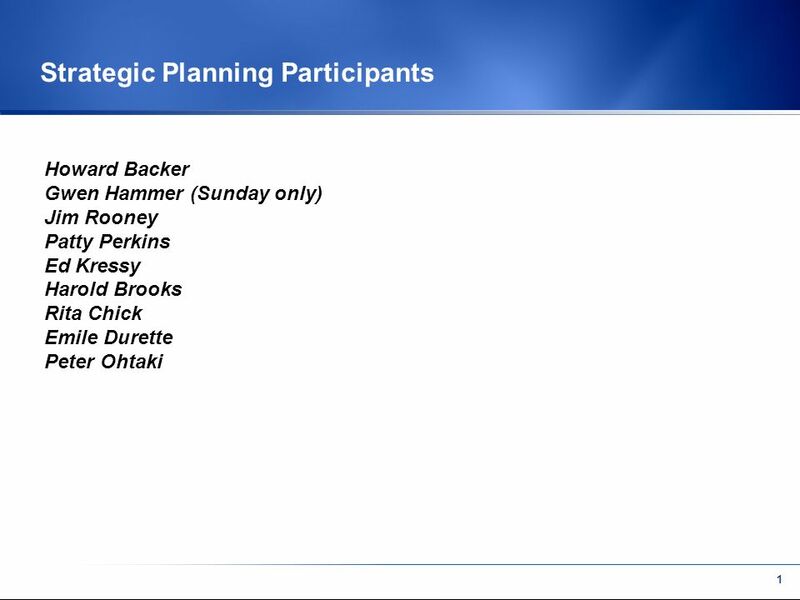 1 Strategic Planning Participants Howard Backer Gwen Hammer (Sunday only) Jim Rooney Patty Perkins Ed. 3 2 Mission and Vision A Mission statement tells you the fundamental purpose of the organization. It concentrates on the present. It defines the customer and the critical processes. It informs you of the desired level of performance. 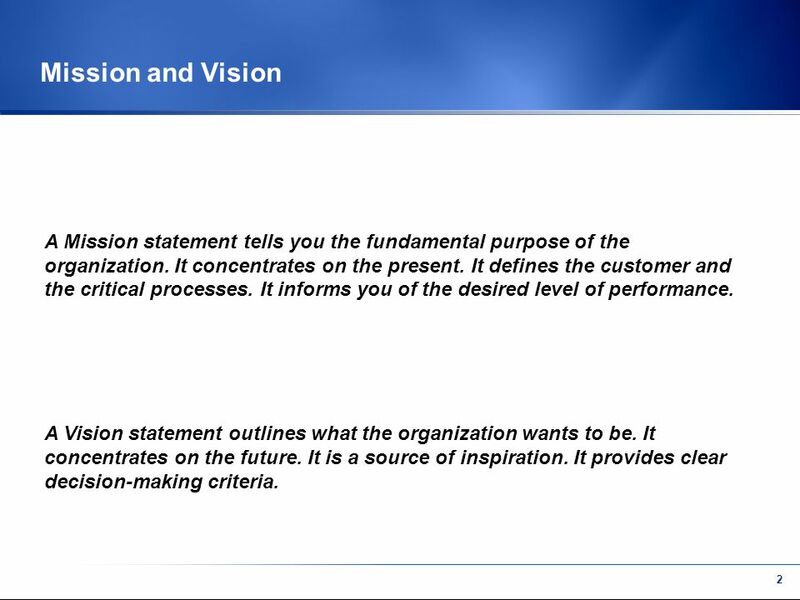 A Vision statement outlines what the organization wants to be. It concentrates on the future. It is a source of inspiration. It provides clear decision-making criteria. 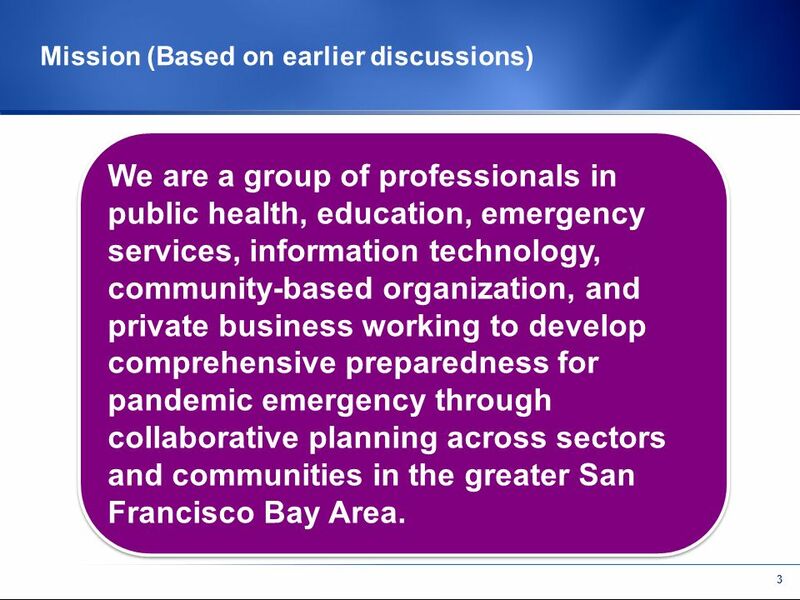 4 3 Mission (Based on earlier discussions) We are a group of professionals in public health, education, emergency services, information technology, community-based organization, and private business working to develop comprehensive preparedness for pandemic emergency through collaborative planning across sectors and communities in the greater San Francisco Bay Area. 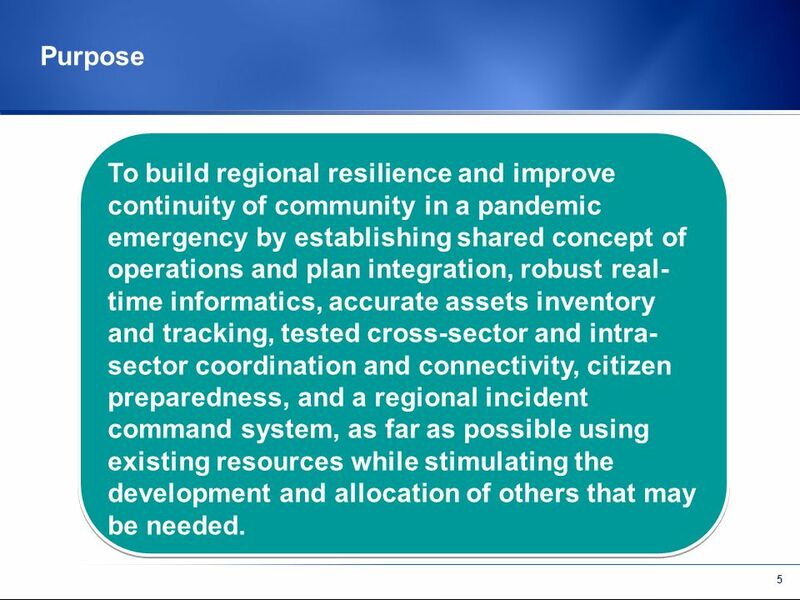 6 5 Purpose To build regional resilience and improve continuity of community in a pandemic emergency by establishing shared concept of operations and plan integration, robust real- time informatics, accurate assets inventory and tracking, tested cross-sector and intra- sector coordination and connectivity, citizen preparedness, and a regional incident command system, as far as possible using existing resources while stimulating the development and allocation of others that may be needed. 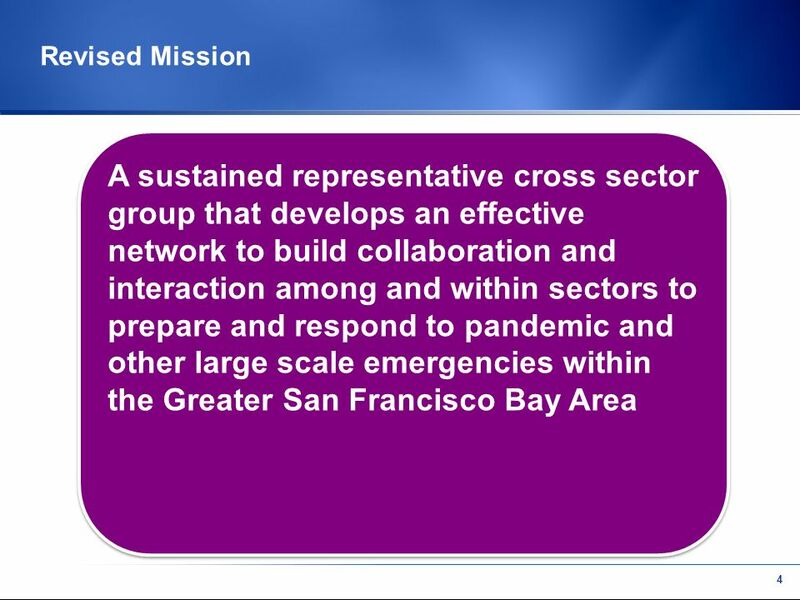 7 6 Vision To be – A Network A Creator of Collaboration An Integrator A Convener A Catalyst A neutral, credible, responsible authority to connect key organizations on the issues of pandemic and other large scale emergency planning. 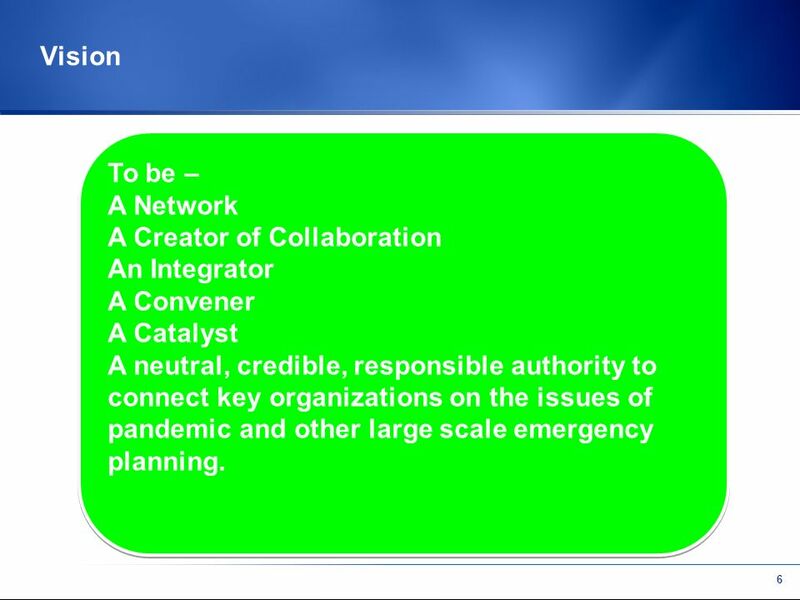 To be – A Network A Creator of Collaboration An Integrator A Convener A Catalyst A neutral, credible, responsible authority to connect key organizations on the issues of pandemic and other large scale emergency planning. 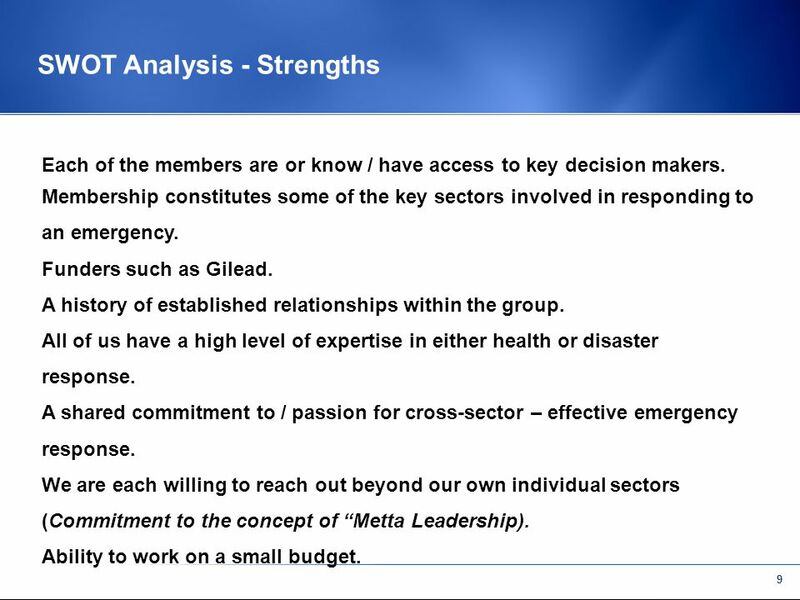 10 9 SWOT Analysis - Strengths Each of the members are or know / have access to key decision makers. Membership constitutes some of the key sectors involved in responding to an emergency. Funders such as Gilead. A history of established relationships within the group. All of us have a high level of expertise in either health or disaster response. 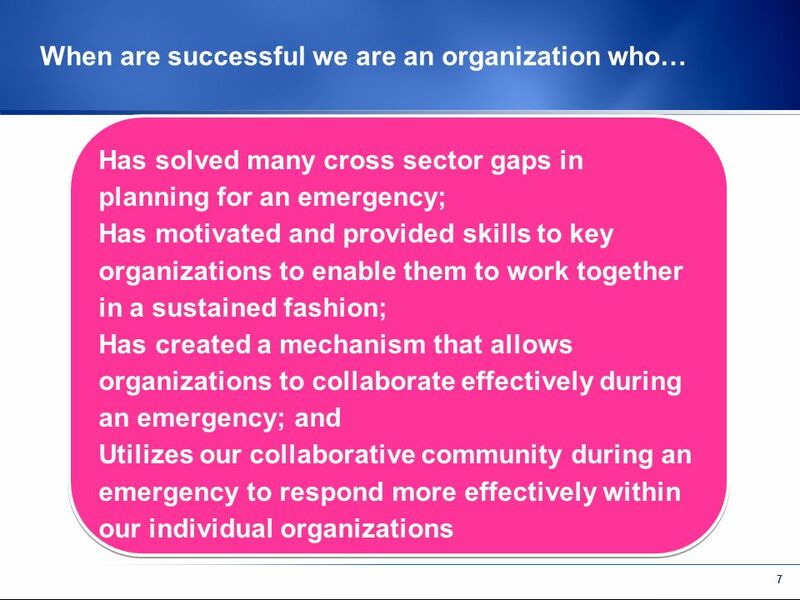 A shared commitment to / passion for cross-sector – effective emergency response. We are each willing to reach out beyond our own individual sectors (Commitment to the concept of Metta Leadership). Ability to work on a small budget. 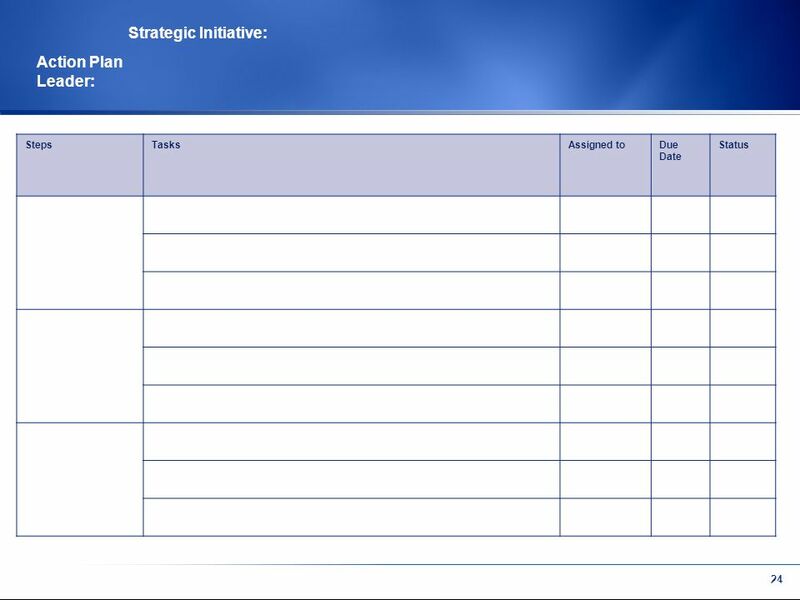 11 10 SWOT Analysis – Strengths continued Willingness to work on a voluntary basis (i.e., Steering Committee). A commitment to make the Bay Area the best prepared region for disaster preparedness. Trust among members of the Steering Committee. We are good at not letting turf and getting credit get in the way of collaboration. A willingness to take risks! (courageousness). We each represent organizations that can draw upon many other prospective partners (network). We have a track record of convening successful events. We have a vision for how the various sectors fit within a cross-sector framework. 12 11 SWOT Analysis – Weaknesses We are dependent upon individuals as opposed to organizational structure (BACSPP has not been institutionalized). Limited personnel and budgetary resources. Some of us have limited direct authority over our sectors. Lack of organizational structure for BACSPP -- e.g., work plan, clear objectives and visible deliverables that demonstrate value to our sectors. Lack of external visibility about the role and value of BACSPP. Not all sectors are represented (e.g., schools / education). We lack a tracking or follow-up mechanism (lack of administrative support) to retain sector partners. 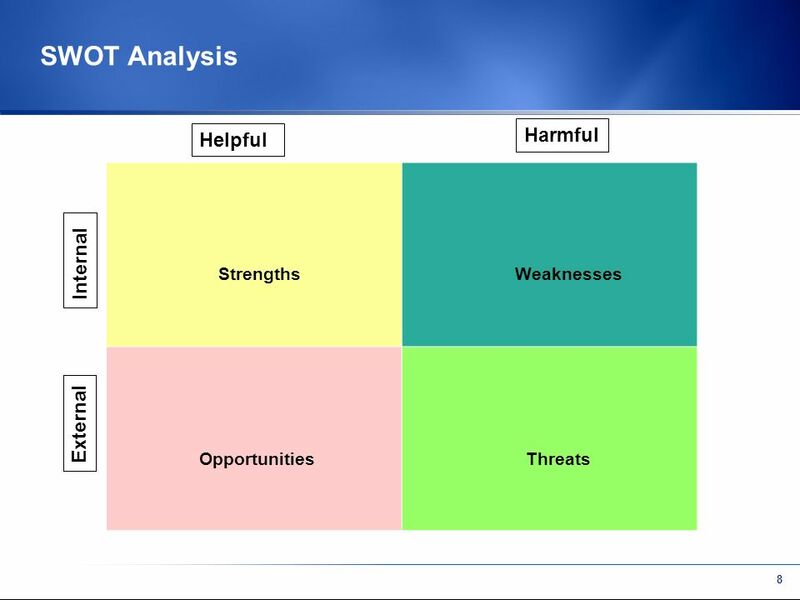 13 12 SWOT Analysis – Opportunities The H1N1 outbreak scare caught the publics attention. 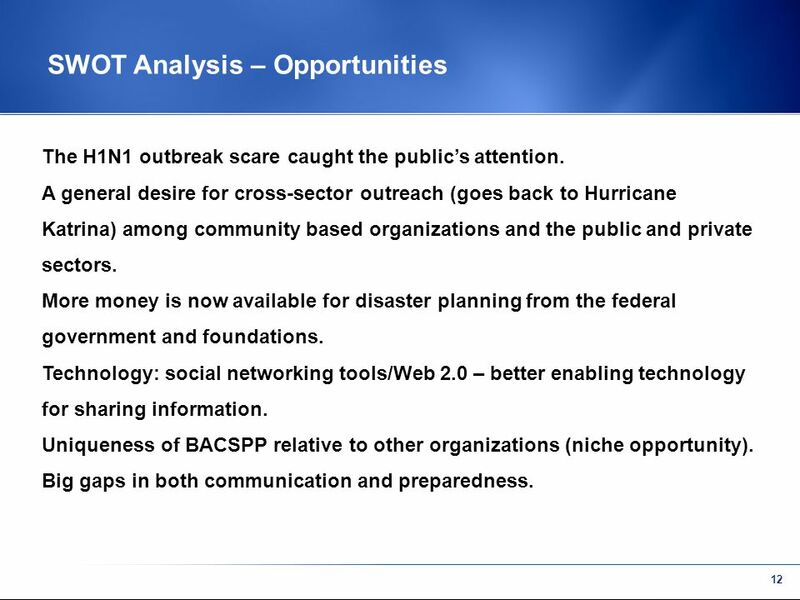 A general desire for cross-sector outreach (goes back to Hurricane Katrina) among community based organizations and the public and private sectors. More money is now available for disaster planning from the federal government and foundations. Technology: social networking tools/Web 2.0 – better enabling technology for sharing information. Uniqueness of BACSPP relative to other organizations (niche opportunity). Big gaps in both communication and preparedness. 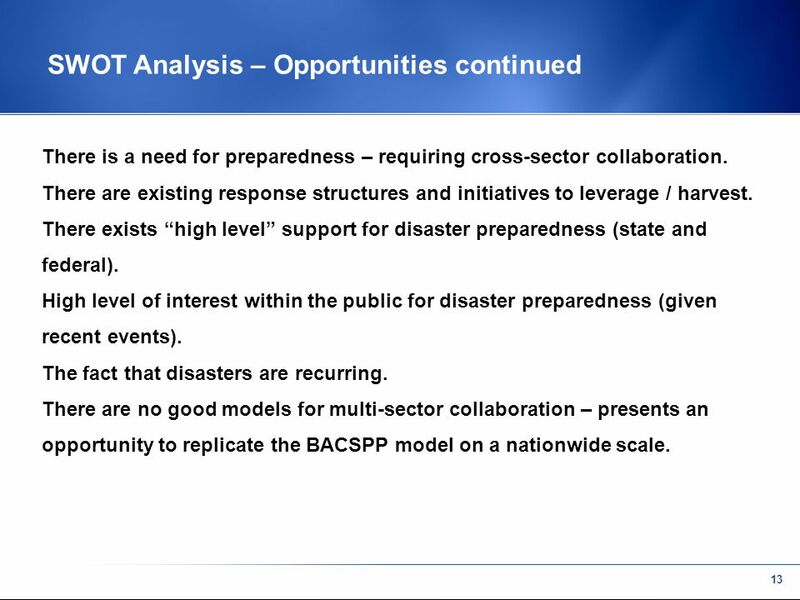 14 13 SWOT Analysis – Opportunities continued There is a need for preparedness – requiring cross-sector collaboration. 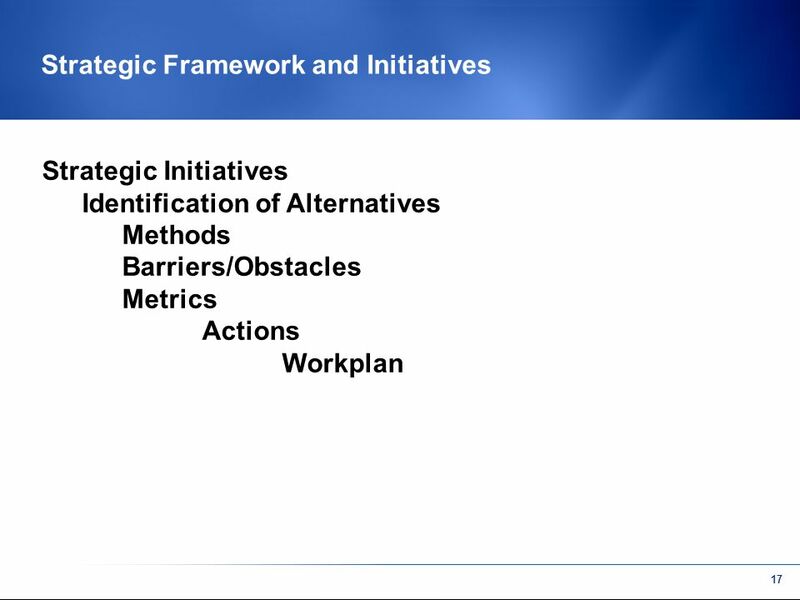 There are existing response structures and initiatives to leverage / harvest. There exists high level support for disaster preparedness (state and federal). High level of interest within the public for disaster preparedness (given recent events). The fact that disasters are recurring. There are no good models for multi-sector collaboration – presents an opportunity to replicate the BACSPP model on a nationwide scale. 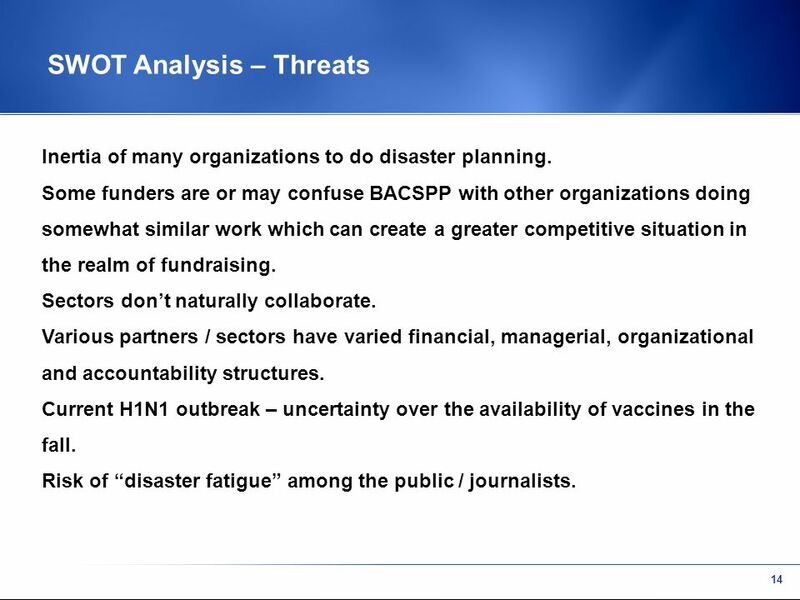 15 14 SWOT Analysis – Threats Inertia of many organizations to do disaster planning. Some funders are or may confuse BACSPP with other organizations doing somewhat similar work which can create a greater competitive situation in the realm of fundraising. Sectors dont naturally collaborate. 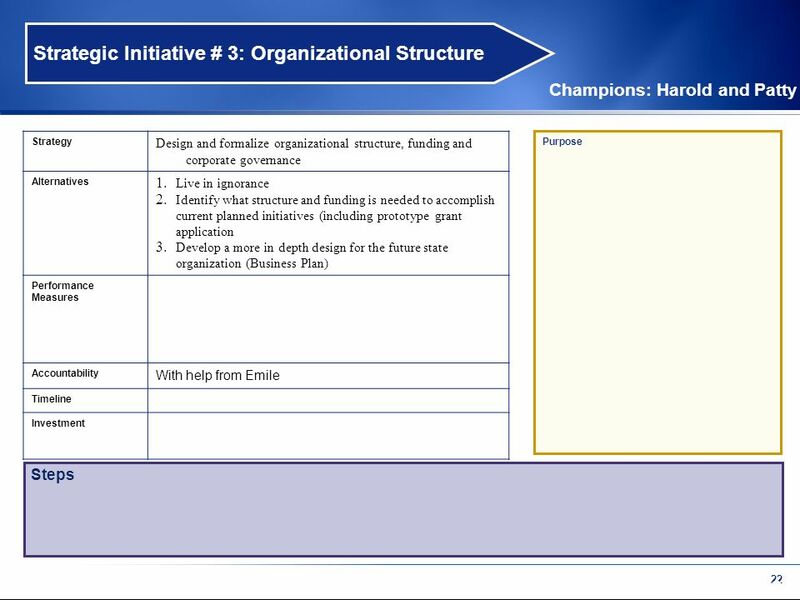 Various partners / sectors have varied financial, managerial, organizational and accountability structures. Current H1N1 outbreak – uncertainty over the availability of vaccines in the fall. Risk of disaster fatigue among the public / journalists. 16 15 SWOT Analysis – Threats continued Regions are not natural / established jurisdictions – they dont naturally coalesce. Limited ability of organizations and individuals to see beyond their usual scope of work. 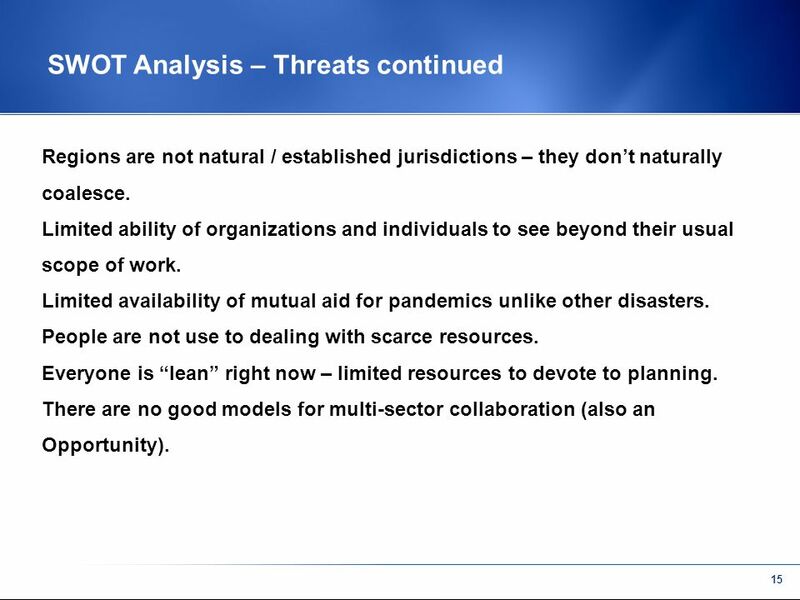 Limited availability of mutual aid for pandemics unlike other disasters. People are not use to dealing with scarce resources. Everyone is lean right now – limited resources to devote to planning. There are no good models for multi-sector collaboration (also an Opportunity). 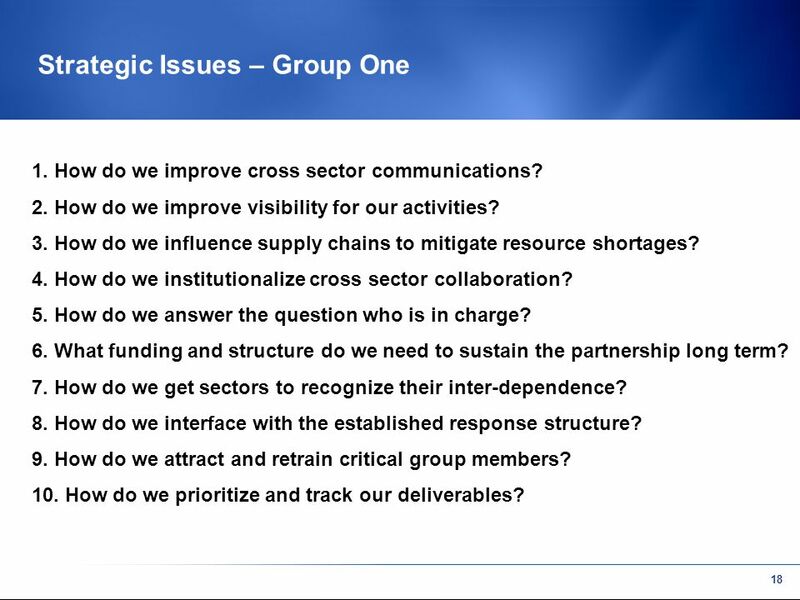 19 18 Strategic Issues – Group One 1. 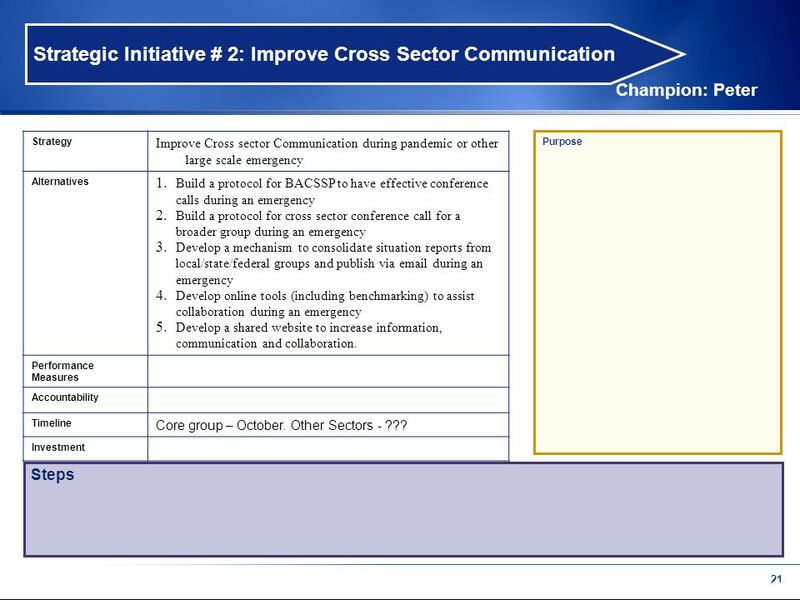 How do we improve cross sector communications? 2. How do we improve visibility for our activities? 3. How do we influence supply chains to mitigate resource shortages? 4. 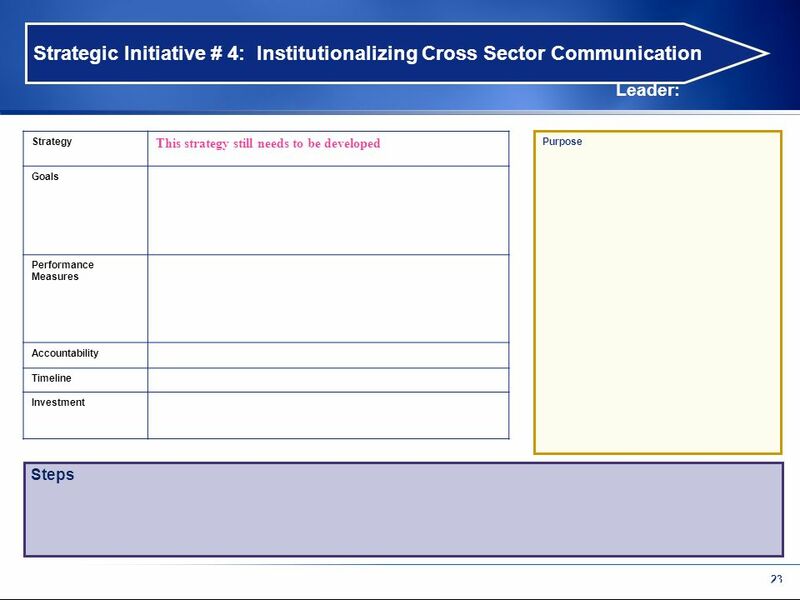 How do we institutionalize cross sector collaboration? 5. How do we answer the question who is in charge? 6. What funding and structure do we need to sustain the partnership long term? 7. How do we get sectors to recognize their inter-dependence? 8. How do we interface with the established response structure? 9. How do we attract and retrain critical group members? 10. How do we prioritize and track our deliverables? 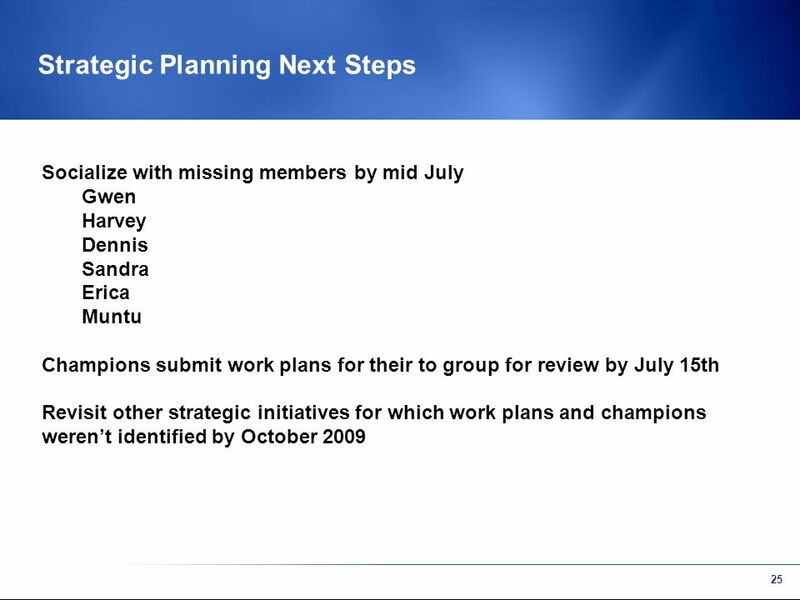 Download ppt "BACSSP Strategic Planning June 28 and 29, 2009. 1 Strategic Planning Participants Howard Backer Gwen Hammer (Sunday only) Jim Rooney Patty Perkins Ed." DYNAMICS OF LEADERSHIPS What it Takes to be a Leader: A Primer Samuel R. Chand. Results of brokering regional PPPs – more than just money Elizabeth Macgregor-Skinner June 15, 2011. AIRS Standards A Comprehensive Overview Building a Quality I&R Program AIRS Conference-Reno, Nevada June 2, 2009 Presenters Charlene Hipes, Chief Operating. This work is licensed under a Creative Commons Attribution-NonCommercial-ShareAlike License. Your use of this material constitutes acceptance of that license. Community Action Workshop Manual A Brief Tutorial Community Action Workshop Manual A Brief Tutorial Harmony Foundation of Canada.